Whew, that flu really knocked me out – I didn’t even want to knit for a couple days, so you *know* I was really ill! But after that the crafting kicked right back in – and hard. 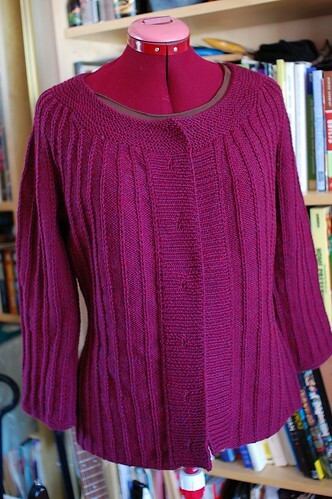 I finally blocked the slip-stitch ridged cardigan I posted about before – now it’s just waiting for some buttons. I’m going to be working on the pattern for this one for the next little while, but the yoke shaping might be a bit tricky to write up! Although I haven’t had much time with my spinning wheel at all lately, I’m finally getting back into the groove. I’ve got this goal to spin down my stash as much as possible before MDSW (will I see you there?). 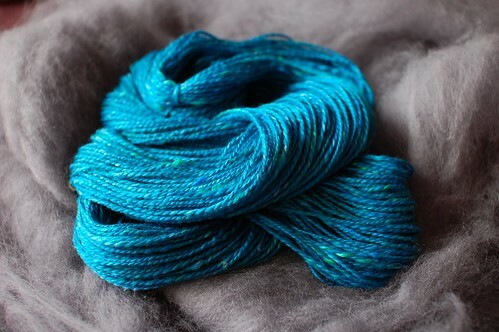 So far I wound off some gorgeous teal yarn that’s been sitting on a bobbin for a long while – this was mixed batts that I got last Rhinebeck. Then I spun and plied up all the grey roving behind the teal there – it was a big fluffy cloud of fibre, also from last Rhinebeck. 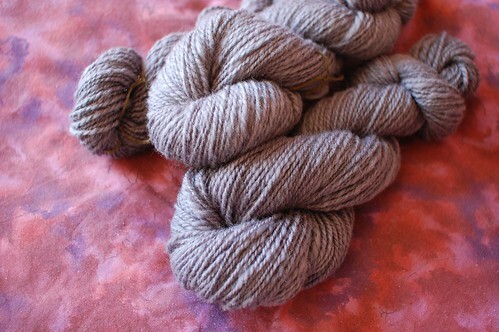 I spun it really fast and furiously to a couple episodes in a row of Six Feet Under (which is awesome, but kinda depressing tv-watching) and came up with 460 yards of 2ply, worstedish weight. It goes really nicely with the teal, so they might end up together in something! All this desire to work through some stash has also resulted in me picking up a hook! This is my very first granny square – inspired by Joelle’s Giant Granny Square, I’m working up a giant granny square of my own. This is nearly one ball of Noro Taiyo, a little bigger than a foot square, and I’ve got five balls. This goes so quickly! I love the colour changes. Might back it with some fabric afterwards, but we’ll see. Happy Easter, Passover…or just Sunday! Glad to hear your feeling better. Love all this! Slipped stitches, teal handspun, Taiyo granny square? Yum! 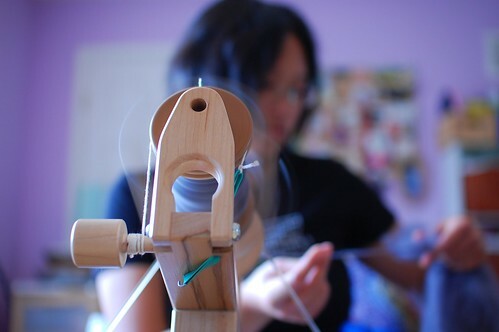 I love the picture of you spinning! Is there a trick to having just a small portion of the picture focused and the rest blurry? I haven’t been able to figure it out and I think it looks so nice. 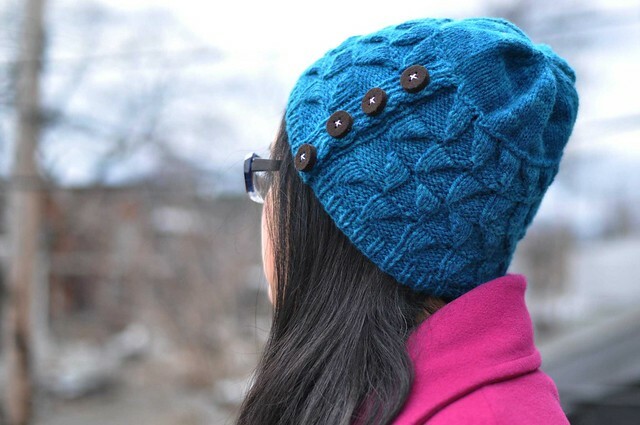 I LOVE the teal yarn too! The sweater turned out beautifully. I’m really looking forward to the pattern release! I really liked the tv show Six Feet Under. Happy spinning! I am finishing up a big ole granny square afghan too but LUV yours in the Taiyo!! Yay!! So awesome you can come to MDSW!! Will you be doing a book signing at MDSW? love that cardi- can’t wait for the pattern! I love making giant granny squares! For the longest time, that was the only thing I knew how to crochet. I’ve branched out a bit and can do some edgings now, but granny squares are still my favorite things to make with a hook. Love yours in the Taiyo! Pretty! Your cardi is really nice! I love the ridges, the shape, and the color! What a gorgeous sweater! I’m in love with that colorway. Hope to see you at MD this year! I’m glad you’re feeling better. That granny square really caught my attention. I’m not much of a crocheter but I do love that. I also have 14 balls of Noro Shinano that I don’t want to use for a sweater, but I’ll bet they’d look fantastic as a giant granny square. Hmmm. 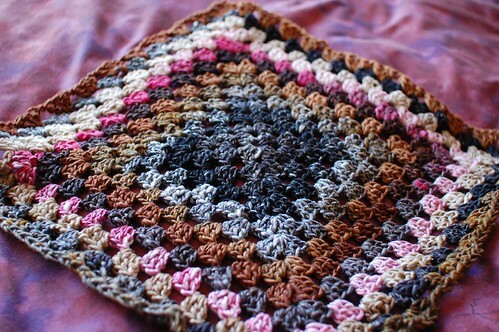 oh this is great to see – my very first project ever waaaay back in highschool in the late 80’s i started to knit a granny square afghan…and then i realised that the easy way to do it was to just keep going round and round and round so i wouldn’t have to seam it! i still have that somewhere…. i ‘ll have to dig it out!